Joe was interviewed as part of the Artist Series for The Sessions, an industry group aimed at providing assistance to musicians and the music industry. 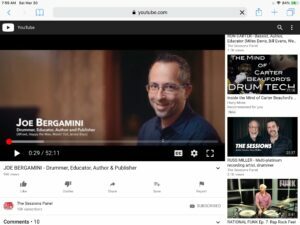 Interviewer Dom Famularo was Joe’s drum teacher and is currently his partner in running their publishing company, Wizdom Media, so their history and friendship comes through in the interview. After watching Joe’s interview, check out some of the other interviews with music industry legends of all kinds, including Simon Phillips, Steve Gadd, Steve Vai, Vinnie Colaiuta, and many, many more. Watch Joe’s Sessions interview here.